You want to make sure that your pet sitter is as prepared as possible to watch your kitty, but there are probably a thousand things on your mind as you prepare for your trip. Here’s a handy checklist of the three most important things to tell your pet sitter about your cat. 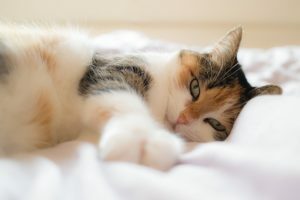 Your kitty may have a clean bill of health leading up to your trip, but certain chronic illnesses such as pancreatitis and FLUTD have a way of flaring up at the least opportune moments. Even if your cat doesn’t currently take medication, it’s important to tell your pet sitter what the symptoms of a relapse look like so that they can be prepared. One of the things that you’ll likely go over in your meet and greet is how to feed your cat, but don’t stop at simply showing your sitter where the food is. You should let your pet sitter know if it’s okay to give your cat extra food if they still look hungry, as seniors and kittens sometimes need extra nutrition. Does your cat usually have a good appetite one day, but snub the food another day? Does your cat have any food allergies? Do they nibble on any plants? Can they have treats? Usually, your pet sitter will ask if your cat bites. Most pet parents will say no, because their cat is very sweet. However, it’s important to mention if your cat will give “love bites” during play time or if they might nip when he or she wants attention. It may not be a bite of aggression, but it’s still a bite! You should also mention how your cat’s mood is in general. Is your cat cool as a cucumber? Does your cat hide under the bed for strangers? Is your cat energetic or playful? It’s important to mention how your cat’s mood is in general because a change in temperament could signal a developing health problem. Keep in mind, though, that some cats behave differently when their parents aren’t around. Are you on the lookout for a pet sitter that’s as thorough as you are? Drop us a line today! Photo by Didgeman on pixabay.